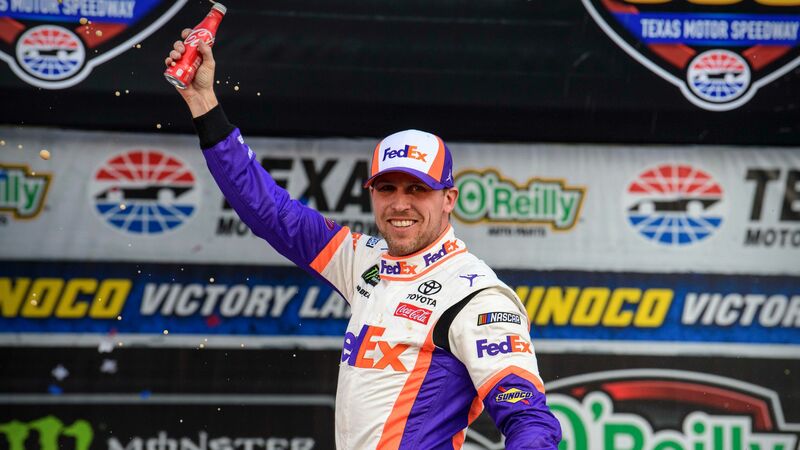 Even a pair of penalties on pit road weren’t enough to stop Denny Hamlin, who rode to victory on Sunday in the O’Reilly Auto Parts 500 at Texas Motor Speedway. Hamlin and his lightning fast car couldn’t be stopped, ultimately finishing more than 2.7 seconds ahead of Clint Bowyer at the finish line to pick up his second win of the season despite a slew of setbacks. Hamlin was penalized for speeding in Stage 1 of the race, then later took another penalty for an uncontrolled tire. There were also some self-inflicted mistakes: Hamlin managed to miss pit road once, and ran out of fuel at another point in the race. But each time he would fall back, Hamlin managed to pass by the field and reclaim the lead. Hamlin would finish the race having led 45 laps, including the final 12, on his way to his second win of the season. Given how well it performed despite his mistakes, Hamlin was happy to give the credit to his car rather than his driving skills. Daniel Suarez, Erik Jones, and Jimmie Johnson finished behind Bowyer to round out the top five positions. Stewart-Haas Racing placed all four of its drivers in the top eight, as Aric Almirola (seventh) and Kevin Harvick (eighth) joined Bowyer and Suarez. Kyle Busch had perhaps his worst result of the season so far, but that says more about his incredible year than his performance on Sunday. Busch led a race-high 66 laps but ultimately finished in 10th place, keeping his season-long streak of top-10 finishes alive for at least one more week. Busch lost the lead late after his car got away from him and went up the track into the wall, forcing a pit stop for a tire change. Busch maintained his lead at the top of the NASCAR Cup Series driver standings, as he is eight points ahead of Hamlin at the top of the list. Those two also lead the current playoff points standings, just ahead of fellow two-race winner Brad Keselowski in third place. Joey Logano is the only other driver to win a race so far this season.